I love books, I cherish every one of them; examining their cover, looking for clues about what lies within and whether I might be sufficiently animated by the content to understand the mechanics of the story, or disappointed by its lack of direction. 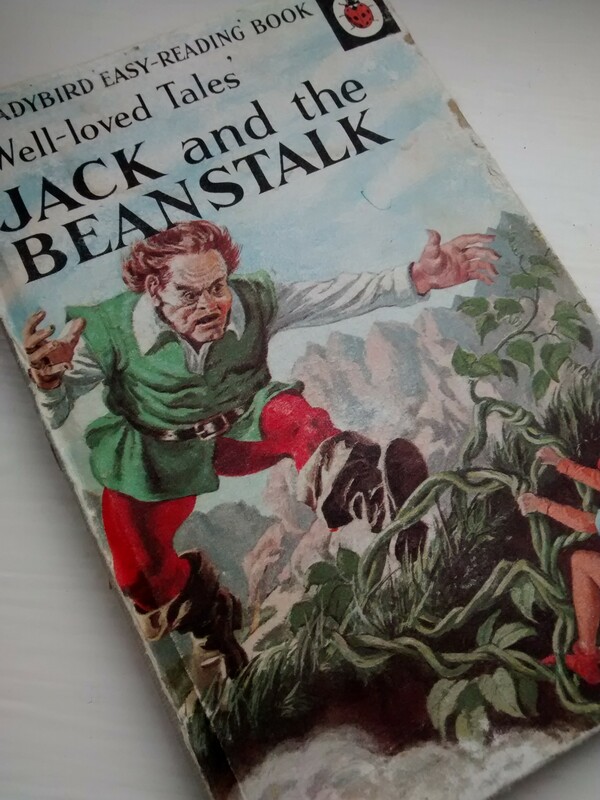 But my delight is all the more heightened if the book is old; I adore the original Ladybird books from my childhood or the Enid Blyton stories. The simple charm of the 1960 and 70’s printing press transports me back to a time when even my greatest childhood worry, by comparison with my adult woes, was insignificant. Well, at least that is how it seems now. And as the age of the books increases so too does my insatiable desire to delight in a bygone era; I marvel at the binding, the neatness and texture of the protective cover that encases and safeguards the pages within. I perhaps have my father to thank for my love of the art of book’s; I spent many a happy hour poring over old books in a wonderful old bookshop in York, my maternal grandmother’s home town. When I examine an old publication I imagine a life and industry that was so much less frenetic, adopting a stance that complemented its consumer rather than shouting and screaming to be heard above the millions of other titles that now jostle and fidget for your attention, emboldened by their garish electric colours and patterns. And it was again due to my dear old dad that I was faced once again with shelf upon shelf of books, not in a bookshop, although there were enough to fill a small literary outlet; but the hundreds I inherited from him. I had to be quite ruthless; for he had spent the last five years of his life accumulating a vast library with such diversity, that should an outsider have looked at them to try and assess the character of the collector, it would have been impossible for them to work out what sort of man my father was. A learned and wise man, whose thirst for knowledge was unquenchable and everything was worth at least one question. But they would be in no doubt that he adored his books and until the dementia finally felled him, he would immerse himself with his chosen quarry, a pen and pad at his side to make notes or to mark a particular page to which he would later return. 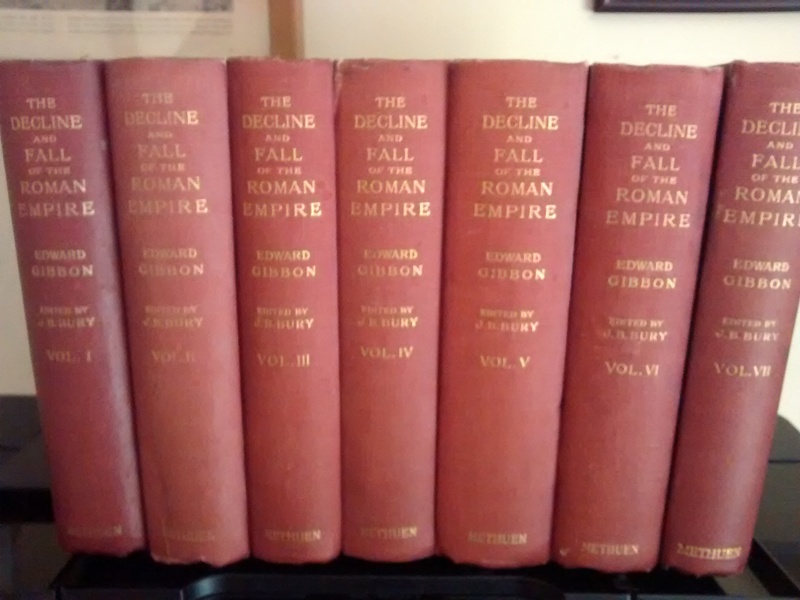 It was on the second and final decant when I scrutinised the books more thoroughly to make sure my final decision was the right one, that I came across seven volumes of The Decline and Fall of the Roman Empire by Edward Gibbon. They are the sixth edition, printed by Methuen & Co Ltd, 36 Essex Street, London in October 1912. More than 100 years had passed since those vehicles of knowledge had set their reader off on their voyage of discovery. It felt like I was holding the key to very large and heavy door that had been locked a long time ago but was now ready to be opened to reveal some great mystery or long kept secret. My initial reaction was that they either had been looked after with exquisite care, or packed away without being read, for they were each a uniform colour, no bleaching by the pre World War 1 sunlight; no destructive cup or glass circles on the covers left by the casual behaviour of a careless reader. The pages are roughly cut and some ill-fitting; it is quite likely they were neatly in line at the time of print, but perhaps the past 100 years has rendered them unable to line up quite so obediently. Most of the pages have at least one literary liver spot, another indicator of its descent into old age. 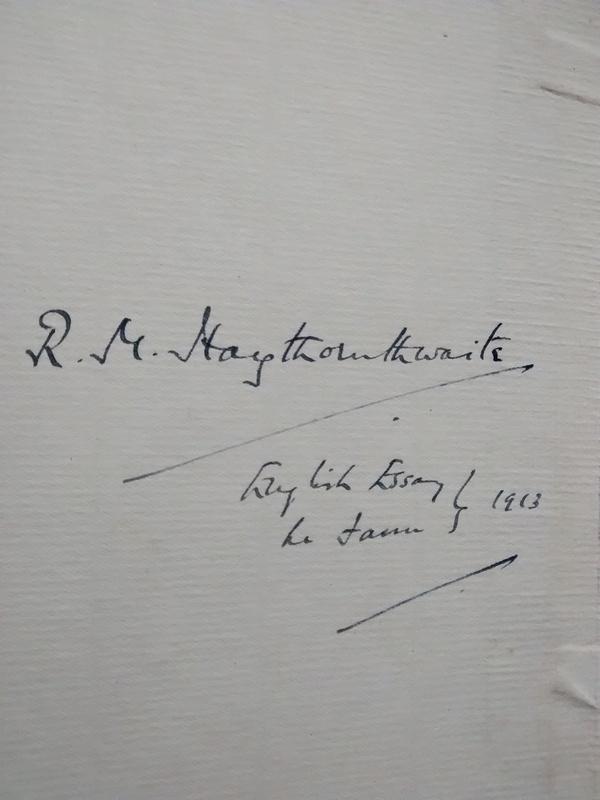 But it was the Edwardian elegance of the signed inside cover that immediately warmed my heart: R M Haythornthwaite 1913. The distinct self-assuredness of the pen stroke; the bold diagonal line under the name; the purposeful note ‘English Essay’ underneath the name. Was he going to write a thesis as part of his English studies? Who had set him this task or was it simply self-improvement he desired? I imagined the reader, as with my father, sitting with notepad and pen ready to scribble down important facts or issues that might later have importance. The spine of each of the seven volumes is utterly intact, so did he, like me, read his books carefully to avoid breaking the precious spine which would have led to considerable page loss I am sure? Or did he never get round to studying the information held within? Did the frontline of World War I stop his literary endeavours? There are no man-made marks on the pages, no pencilled reminders in the margin or asterix to highlight a phrase; not one page is dog-eared where he might have folded the corner over to mark the page he had reached. However, there is a ‘Law Union & Rock Insurance Co Ltd’ bookmark in between page 64 and 65 of volume IV. (Thanks to the online London Metropolitan Archives I know the Law Union & Rock Insurance Co Ltd on Chancery Lane existed between 1857-1919). I wonder, is this the page he reached before going off to war and I wonder did he ever write that essay? And it was the penned signature, mindfully written in each volume and the bookmark that held his place ready for his return that made me wonder about the person who had signed their name and who obviously had a love of books equal to mine and my father. Whilst I did not know this person, with what I had; the preserved volumes, the protected pages and the simple contact he must have had with a well established insurance company, I felt I somehow knew him; that if I bumped into him on the street, it would be like meeting an old friend from long ago. And so my search began and as with all great friendships, it wasn’t hard to pick up the trail. With the help of our inexhaustible online world I soon found the Haythornthwaite family website and contacted the descendants of the books’ owner. This is the beginning of a story about a little boy who was born during the time of Victorian values, into a family that held great religious fervour; the story of a little boy who had only just reached adulthood with all its riches and fascination stretching before him; the story of a little boy who became a man and lived briefly only to witness the savagery of the grown-up world where greed and intolerance led to the horrors of war. It will take a while to find the missing pieces of this jigsaw but I am confident that when it is finished, it shall be a legacy for all the children who had to grow up too quickly and die too soon. My hope is to create a story that will not only animate you, the reader, but will make you want to deconstruct the mechanics of the chapters and perhaps help to reconstruct a world where children need not bear witness to the behaviour of the grown-up world. This entry was posted in The Haythornthwaite Story and tagged books, boy, childhood, Edward Gibbon, fighting, first world war, front line, Haythornthwaite, soldier, the decline and fall of the Roman Empire, the great war, World War 1. Bookmark the permalink.